This page contains information about me, links to other sites that I have created and some others that might be of interest. I gave up full-time work over seven years ago, having worked in the computer industry for nearly thirty-three years, for the last fifteen years for Hewlett-Packard UK Ltd. as an Account Support Manager. See more details below. I studied at the University of York, gaining a joint honours degree in Maths and Music. I was educated in Rugby, Warwickshire, at Paddox County Primary School and Lawrence Sheriff School and am a member of the Old Laurentian Society. I live in West London and am married with two children, one is a teacher and married with two children, the other is married with two children and runs an LED lighting company. Most of the things I am involved with are related to music: I am the Organist and Choirmaster at St. Mary's Church, Osterley and Musical Director of Whitton Choral Society. I do quite a lot of singing, I play piano, church organ and electronic keyboard, I compose and arrange choral music, and I teach music theory and sight-singing. 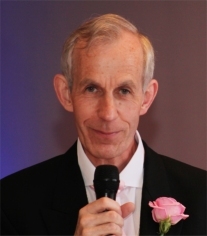 I was on the executive committee of the Hounslow Festival of Music, Speech and Dance for thirty-two years and ran the piano section for twenty-five years and the instrumental section for fifteen years. I subscribe to New Scientist magazine and like to read "popular science" books, with a particular interest in cosmology and neuroscience (how the human brain works). I try to keep fit and enjoy running, you might see me in the fields round Osterley Park or along the towpath of the Grand Union Canal. I started and ran a new Table Tennis Club during 2012 and in 2013/2014 I ran a Computer Club. Over the last twelve years, my wife and I have had a number of holidays in Cornwall and we have walked over three-quarters of the South West Coast Path in Cornwall, a total of over 220 miles. Until April 2011 I worked for Hewlett Packard (HP), which was the largest technology company in the world when it took over Compaq in 2002, which itself had taken over Digital Equipment Corporation (DEC) in 1998. A DECsystem-10 was the first real computer I used at York University in 1976. I was an Account Support Manager in the HP UK Customer Services organisation, providing support services to a specific customer. This means I was responsible for proactive as well as reactive support on the most important computers in the customer site. The operating system on most of these computers was HPUX, which is HP's version of Unix. I got involved with recommending patches (code fixes to known problems), answering technical product questions and running meetings to review the service we provided. I mostly worked at the customer site, but I also visited the HP UK headquarters office in Bracknell, Berkshire. Prior to working for HP, I had worked for Wang UK, a now defunct computer manufacturer, in support and marketing, and for Stewart Wrightson, a Lloyds Insurance Broker, as Technical Services Manager in the City of London. I had started work in computing as a programmer with British Airways, and I still enjoy solving problems (see my spreadsheet to solve SuDoku puzzles). The organ in 1962 This is the organ I play every week at St. Mary's Church, Osterley, a Church of England parish church in the Hounslow Deanery where I have been organist and choirmaster for 16 years. The organ is a three-manual instrument, built by Gray & Davison in 1857 and modernised by Comptons in 1962 (which is when this picture was taken). A detailed history of this organ can be found here (general information about organs here). You can hear some extracts of me playing on my page about wedding music. On June 24th 2012, I played an organ recital with Rachel Pickering partly to celebrate the fiftieth anniversary of the electrification and expansion of the organ. I run a mixed four-part choir of around 18 members that is affiliated to the Royal School of Church Music. We normally sing an anthem every week, a list of those we have sung at Sunday services can be found here. In 2003, I played the organ for a concert performance of the well-known Saint-Saens "Organ Symphony" with the Hounslow Symphony Orchestra conducted by John Andrews - here is a short sample (152Kb MP3) recorded at the concert. In January 2005, I organised the music for a concert to honour the retirement of the vicar and his wife after 21 years at the church - see this local paper report. The church has some very fine Victorian stained glass made by Heaton, Butler and Bayne. Neil as choirboy, c1967 I started piano lessons at the age of five, passed ABRSM exams up to grade 8 and studied piano with George Nicholson at York University. I started singing in a church choir at the age of 10 (see picture!) and attended two residential RSCM courses, from where I was selected to attend cathedral courses at Westminster Abbey and Norwich Cathedral. 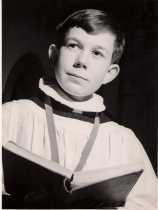 I was appointed organist and choirmaster of Holy Trinity Church, Rugby, at the age of 17 before I left school. I then sang with the University of York choir. I joined the choir of St. Mary's Osterley in 1978 and was also deputy organist for 20 years. During the late 1970s and early 1980, I conducted a very small madrigal choir which met in the front room of a house. I joined Whitton Choral Society in 1997, and sometimes accompanied or conducted rehearsals for them. Following the death of the Director of Music in April 2009, I was appointed to that position. I conduct weekly rehearsals and direct three concerts a year, which sometimes involves professional soloists. In 2014 and 2018, I conducted joint concerts of Whitton Choral Society and Richmond Choral Society. From 2007 to 2009, I sung with The Hythe Singers, a chamber choir based in Egham Hythe near Staines, Surrey and set up their web site for them. A composition of mine, "The first snow of the year" was performed by them at Christmas 2008, and I sometimes get asked to help them out by singing at their concerts. In August 2012, I conducted this choir at short notice at the Egham Royal Show. Between 2007 and 2013, I sometimes sang with the University of London Church Choir and sang with them in Southwark Cathedral a number of times, at Lambeth Palace three times for the Archbishop's award ceremony, and at St. Alban's Cathedral. I also sing with Kingston upon Thames Madrigal Society, and conducted half of a rehearsal for them at short notice in December 2015. Once a year, from 2000 to 2004, I conducted an ad-hoc choir of 50-70 singers in St. Paul's Cathedral for the Mothers' Union London Diocese. In June 2015, I was asked to conduct the same service again, at quite short notice, and I also did it in 2016 and 2017. In 2004, I conducted a Hounslow Deanery combined choir for a service in Bath Abbey. In December 2006, I was asked to write a piece of music for a Hounslow Symphony Orchestra concert to celebrate the 150th anniversary of the church - I called it Sesquicentennial Fantasia.